The principle of the University of Gezira Dr. Abdullah Salman headed on the 17th of January the meeting of the Higher Committee of the University of Gezira Educational foundation in the presence of the secretary of Scientific Affairs Dr. Adel Daifallah, the dean of the faculty of education Dr. Zeinab Kasab and the Director of the Foundation Dr. Abdul Azim Tineer and a number of members of the Committee. 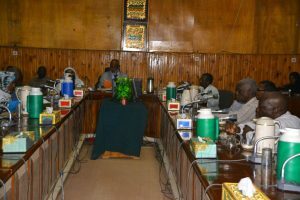 The meeting discussed a number of agenda including the preparation for the next year and the reports of the committees, where Dr.Zeinab Kassab presented a detailed report on the establishment of the school from the beginning and until now in the two levels basic level and secondary level and many of the procedures that accompanied the establishment and the importance of the establishment of educational foundation which follows to the University of Gezira and it serves the community as a central goal of the University. The meeting also discussed the reports of the technical committee and the possibility of establishment of a separate accounting unit for the foundation. The school accommodates 40 students at the basic and secondary levels, and in view of the great turnout and increasing demand for them . Dr. Abdul- Azim Tineer stressed the need to add teachers for the two levels to meet the potential expansion in the new year, in addition to the need for staff for administration, stressing that the turnout of students is a great push for the foundation.